Wednesday, Feb. 6 from 7-9 a.m. we celebrate our U biking community. Bikers stop by on your morning commute to the University on our annual Winter Bike to the U Day. Down a hot drink and win cool prizes. Did you commit to improving your health by getting more exercise in the new year? Is it difficult to find the time to exercise during your busy day? Activate your daily commute and you’ll do both. Make walking or biking a part of your commute to the U to improve your physical health and help clear our air. As you experience the benefits of walking or biking, also known as active transportation, you are contributing to a healthier community—in terms of physical and mental health and in cost savings. When active transportation is a part of your lifestyle you save money on fuel, spend less time in traffic and get your daily workout as part of your commute. You also help cut vehicle emissions that contribute to Utah’s poor air quality while reducing the demand for vehicle parking on campus. University survey data indicates a majority of us live eight miles or less from our campus destination. Riding a bike is a great way to commute over short distances and keeps you active during the day. Bicycling to the U saves time and money as you don’t have to search for vehicle parking or pay for a permit. 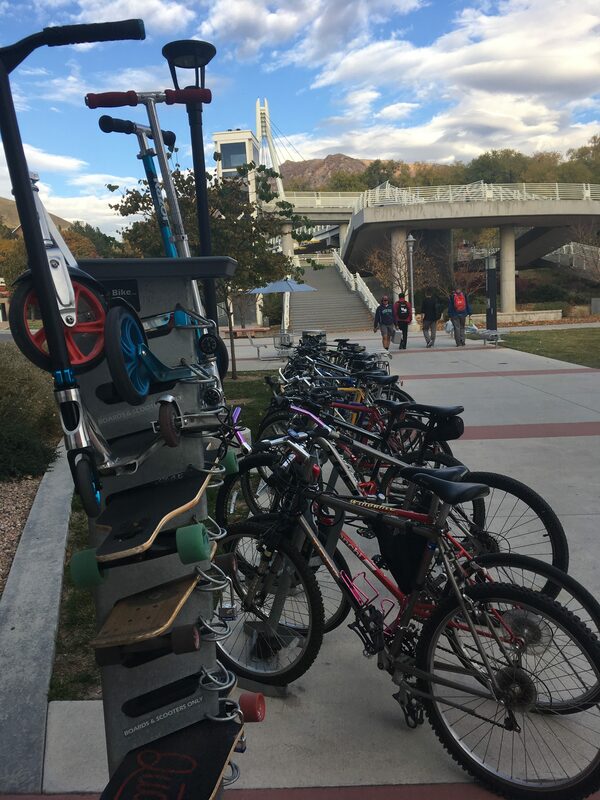 A majority of campus buildings have a bike rack at or near a building entrance, giving you a free parking space. The university even has its own Campus Bike Shop for repairs located in the Annex. Another active commute option for Salt Lake City residents is renting e-scooters or e-bikes from Lime or Bird. Currently, the university allows these devices to access the campus. Just like a bicycle, rentable e-scooters and e-bikes must only be parked adjacent to an outdoor bicycle rack. When operating a Lime or Bird device on campus sidewalks, you are responsible for following the university operating guidelines. If you normally commute in your personal vehicle, rethink your trip and try public transit. You will have more personal time to study or work on the bus or train and can bring your bike with you to quickly move between campus destinations. Safety is key with active transportation. Plan your walking or biking route with the campus map and observe where all sidewalks, bikeways and crosswalks are located. Be aware of your surroundings (look up from that phone screen), wear clothing that is easily visible to motorists, slow your speed on campus pathways and always give pedestrians the right of way. So get out and walk to the bus or train, hop on your bike, push a scooter or skateboard or if you drive alone in your car, park farther from your destination and take a brisk walk. These are all great ways to improve your physical health, save money and help clear our air—every single day of the year.